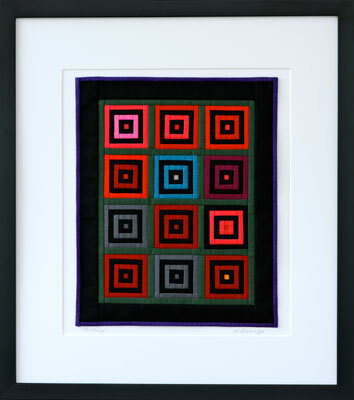 The artistic success of a quilt lies in the interplay between color and pattern. My “Bullseye” quilt, a variation of the Log Cabin pattern and inspired by a vintage 1930-40 Amish quilt, hits the mark. Cotton fabrics in solid, deeply saturated, harmonious colors help the eye move across the surface without interruption. The subtle values and saturation gradations give the illusion of movement. Individual blocks appear to advance or recede, and the blocks appear to vary in size, although all are the same. The result is a sophisticated use of neighboring colors to create a patchwork design with harmony and intrigue. Was this intuitive in the original quilt, purposeful, or just a matter of what was in the scrap bag? I think it was intended. As I work, I sense a connection with the women who made early quilts, with their creative choices as well as their lives and their historical context. In my miniature pieces I hope to preserve and validate these singular, deeply personal works of artistic expression.